​Many people report that they hit a wall in Cognitive Behavioral Therapy* (CBT), even with a very good therapist with whom they enjoy working. This may be because there are pieces of what we've all been through that simply cannot be resolved by talking and adjusting our thoughts, nor exposing ourselves to the traumatic experience through talking about it and "learning" to "choose" to become calm. That's because there is part of the response to the experience that is not within conscious control. 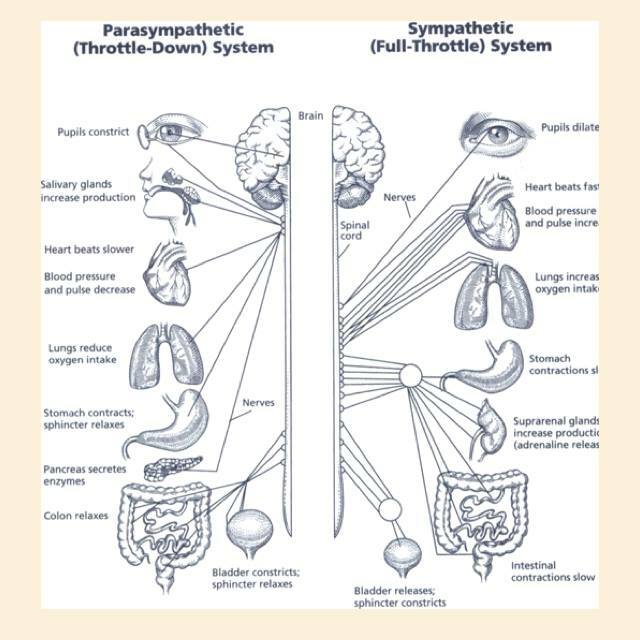 It's in the autonomic nervous system, like heartbeat and digestion. And to heal that part, we have to work with it, and that work is in the body. 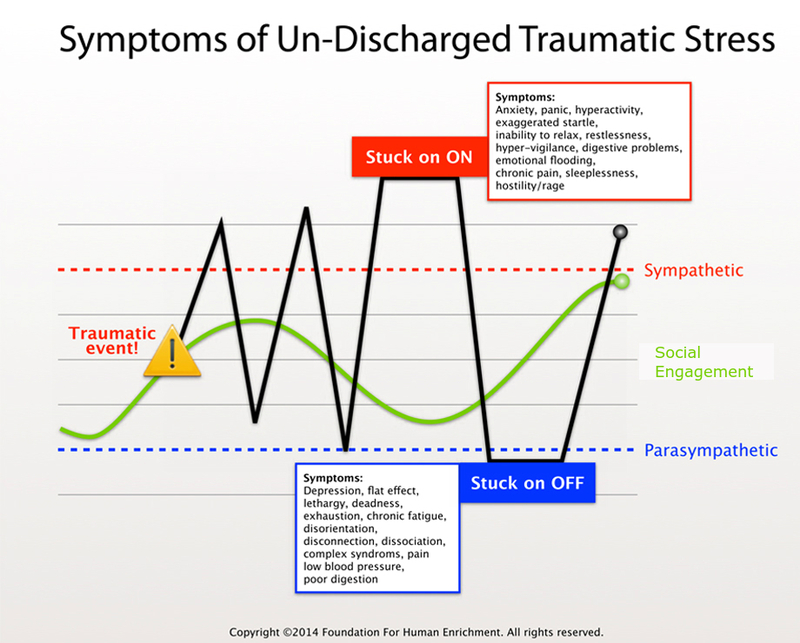 Similarly, many people report that their post-trauma or anxiety symptoms get worse at some point in Prolonged Exposure Therapy, which is a commonly used method that requires telling the traumatic story over and over again as a form of desensitization. 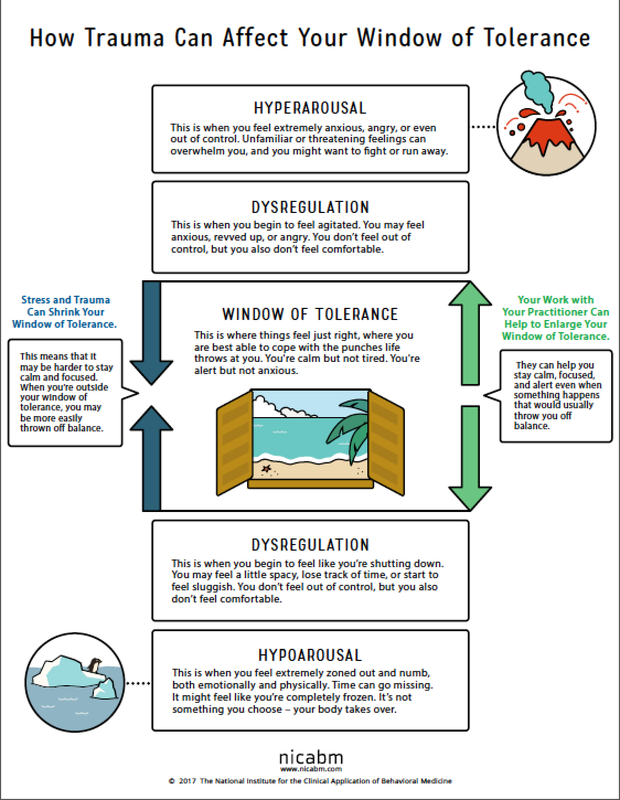 As the great trauma researcher and humanitarian Bessel Van der Kolk has said, desensitization is not healing. In somatic, EMDR, and Depth therapy we do not ask anyone to tell the story over and over again. We know how to work in ways that are meant to cause as little distress as possible. Of course, sometimes therapy can be hard work. But we work very hard to avoid it being retraumatizing. Somatic psychotherapy does not require talking about the traumatic experience(s). 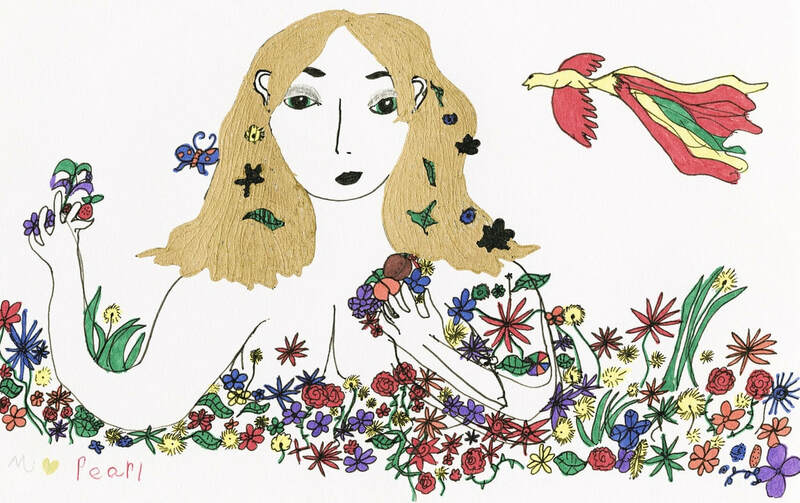 In fact, it's not even necessary to remember the trauma, since somatic psychotherapy works with what is held in the body, as felt in the here and now. There is a "mindfulness" component to somatic psychotherapy that fits very well with the Buddhist and Advitic mindfulness training I had before training in SE, in that we practice noticing what's present in the body, letting go of attachment to the thoughts, and being present in the moment. However, it is very important that I make clear that part of this work is understanding that the body, even the present moment can be a frightening place those of us with trauma (even if we don't remember it), and I meet each person where they are at, right now. At first, being present may be a simple as noticing the room. There is no right or wrong in this work, and each person begins where they are at on each day they arrive. We will progress as we go, at your pace. "SOMATIC EXPERIENCING (SE) is a potent psychobiological method for resolving trauma symptoms and relieving chronic stress. It is the life’s work of Dr. Peter A. Levine, resulting from his multidisciplinary study of stress physiology, psychology, ethology, biology, neuroscience, indigenous healing practices, and medical biophysics, together with over 45 years of successful clinical application. 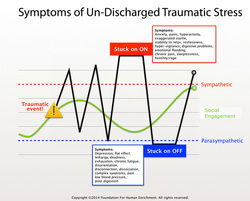 The SE approach releases traumatic shock, which is key to transforming PTSD and the wounds of emotional and early developmental attachment trauma. I have completed one year of SE training. ​I do not use touch in my practice. This image illustrates the basic idea of how pendulation works in SE. 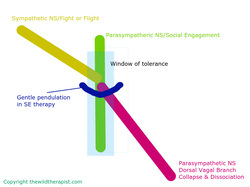 Penduation in SE is the gentle movement between regulation and disregulation. 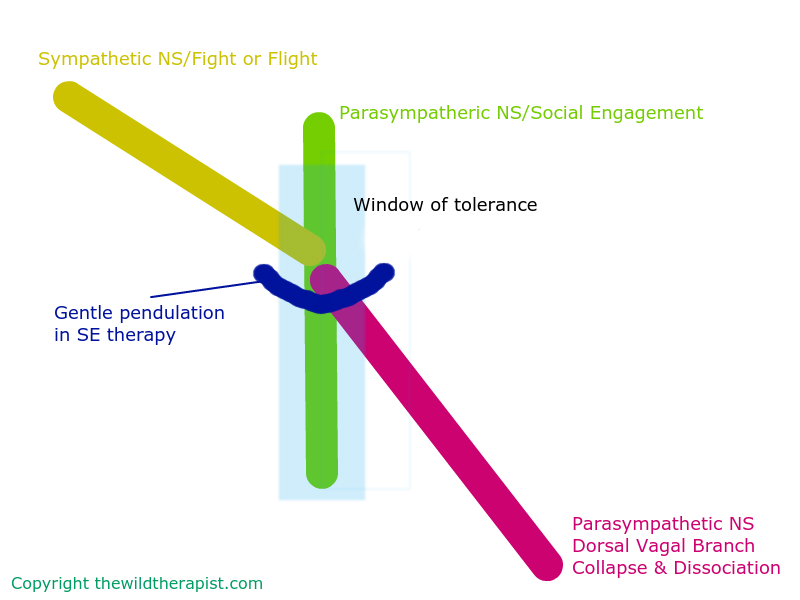 Gentle pendulation increases a persons capacity and flexibility, and discharges held energy from the body by helping the ANS complete the threat response cycle, which may have been thwarted once upon a time. This image is here to help you begin to tune in to which one of the basic ANS modes you're in at any given time. 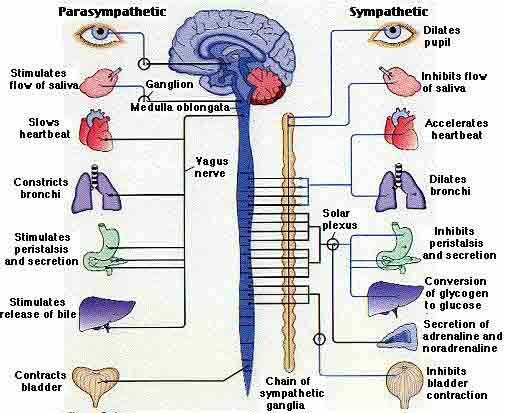 You'll see it shows PNS and SNS connections to organs through the vagas nerve branches.